The National Aboriginal Health Strategy (NAHS) was developed by the National Aboriginal Health Strategy Working Group in 1989 following extensive national consultations with Aboriginal and Torres Strait Islander individuals, organizations and communities and with governments. It was a landmark document providing agreed direction for Aboriginal and Torres Strait Islander health policy in Australia. 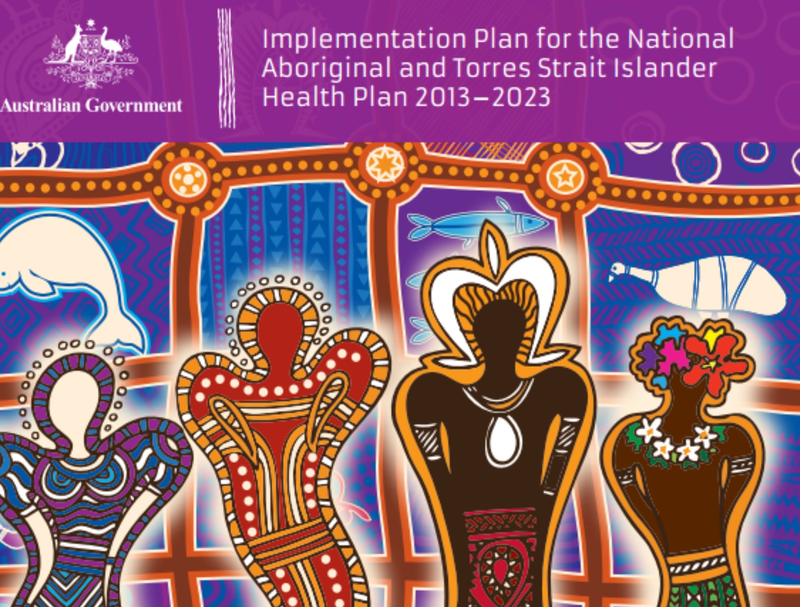 In July 2003, the National Aboriginal and Torres Strait Islander Health Council stated that the NAHS was ‘never fully implemented [but] remains the key document in Aboriginal and Torres Strait Islander health. Key priorities identified in the 1989 National Health Strategy included building community control of Aboriginal health services, increasing Aboriginal and Torres Strait Islander participation in the health workforce, reforming health system and increasing funding to Aboriginal and Torres Strait Islander health services. The strategy also supported increased community education, health promotion and prevention, improvement of the effectiveness and adequacy of essential services such as sewerage, water supply and communication, and building effective intersectoral collaboration. It noted that Aboriginal and Torres Strait Islander communities must participate in research to ensure it is ethical and research findings must be monitored and reviewed to ensure implementation. Provided an opportunity for Indigenous males from around Australia to express their views and share their experiences of health. Delegates to the Convention explored strategies to improve the health and well-being of Indigenous males, their families and their communities. Developing separate strategies for men’s health and women’s health can be highly effective in the short term. 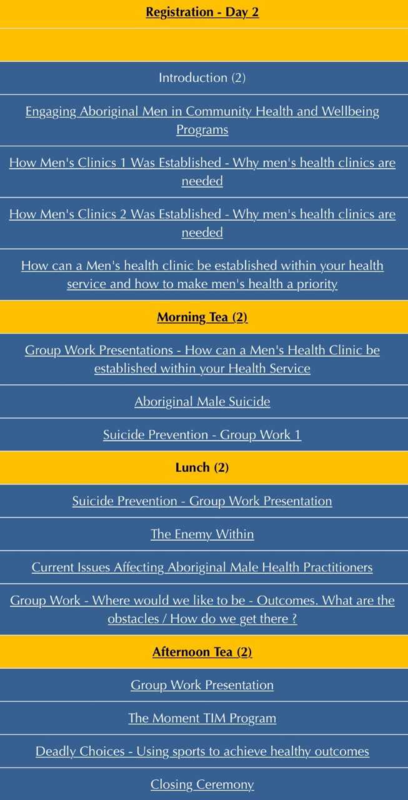 If a men’s health clinic is not at a main health centre but is housed a few blocks away, Aboriginal men are more at ease, are more likely to consult a male doctor for a specific problem, and are more likely to return for follow up. The concept of separate gender strategies also applies to health promotion. The achievement of Aboriginal men in sport has been a source of great pride and many Aboriginal men are able to demonstrate community leadership through this success. Sports and fitness programs are an important part of Aboriginal community development in general. This is especially true for the health of young people, as sports and fitness programs are likely to contribute to their physical and emotional wellbeing. Physical fitness programs can form a focus for active life skills, as opposed to negative coping mechanisms such as alcohol and substance abuse and other destructive behaviours. Successful programs often provide some kind of incentive to Aboriginal men to encourage them to become involved. This might be access to the local golf course, or to the local gym; or it could be providing a meal to encourage a more informal atmosphere and sense of fellowship. A program or service will have greater success if it aims to be relevant to the needs of local Aboriginal men. For example: in one area, Aboriginal men were embarrassed about seeing a female health worker in a sexual health clinic; so they worked together to establish a separate clinic in a location where they felt more comfortable. As a result attendance increased by 600 per cent. The role of men in Aboriginal society has changed tremendously in only a few generations. 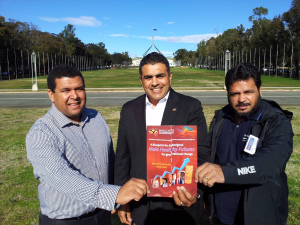 Aboriginal men have experienced a loss of their traditional role in both society and family. This results in despair, shame, and a sense of inadequacy. Some men feel that they cannot contribute to their communities any more. 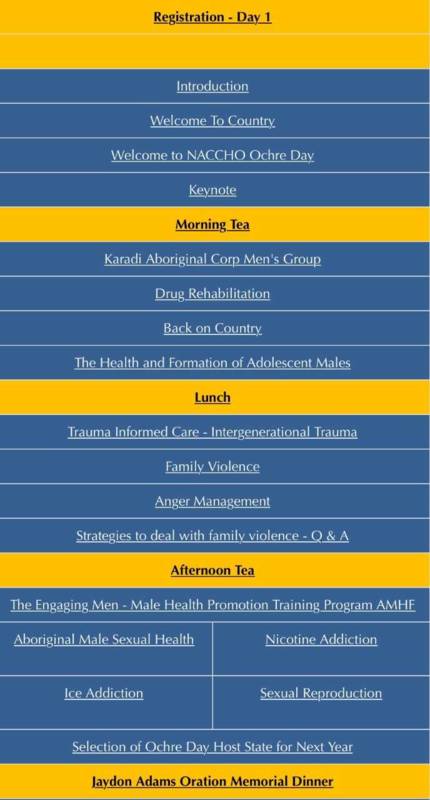 This can be influenced by programs and services that highlight a positive role for Aboriginal men in their communities and families. Compared to non-Aboriginal men, Aboriginal men suffer a higher burden of ill health, and have a significantly lower income, so the cost of medication is an important issue. Aboriginal men need to be informed about any benefits they are eligible for, which can reduce the cost of medication. Local medical practitioners should be encouraged to work closely with local Aboriginal health workers, and to develop partnerships with them. In local areas is it essential to increasing the number of health practitioners who understand the needs of local men, and whom local men feel comfortable consulting. Partnerships are about working collaboratively in an environment based on respect, trust, and equality. 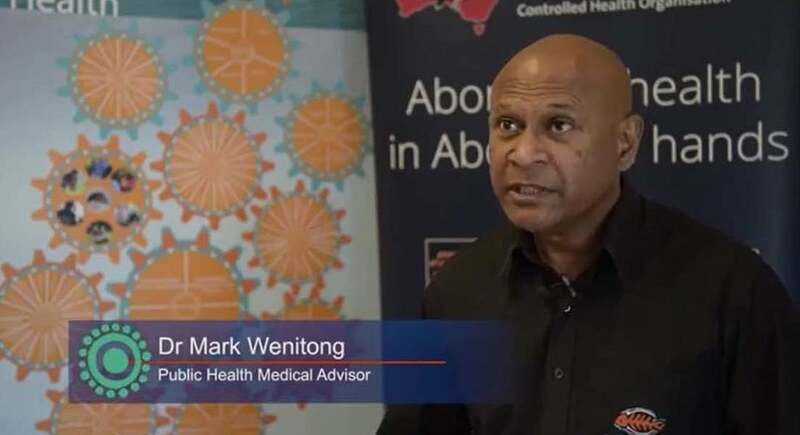 Aboriginal health workers across NSW need to be encouraged to provide the kinds of programs and services that most benefit Aboriginal men in their communities, through partnership between health service delivery and projects of community interest. Research is needed to develop an evidence base on which to improve service delivery for Aboriginal men. Issues in need of further research include: how to integrate men’s health programs into existing Aboriginal primary health care services; how to increase the participation of Aboriginal and Torres Strait Islander men in the research process; how to better target research that aims to improve Aboriginal men’s health; how to improve access to health services for Aboriginal males in urban, rural and remote areas; and what strategies and programs provide the best health outcomes for Aboriginal men. There also needs to be greater encouragement to publish existing research. Approximately half of Australia’s Indigenous population is male. Knowledge of the status of their health, although not complete due to limitations on Indigenous identification, is an area of acute need. A ‘gendered approach’ to health is not a new idea and it is becoming more apparent that gender is a key determinant of health in Australia. The interaction between gender and health has been well recognised and has proved very useful with respect to women’s health. 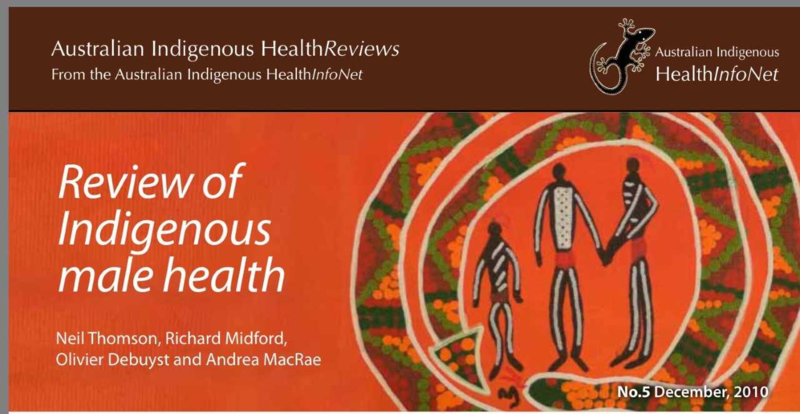 It may be possible to achieve better health access and outcomes for Indigenous males by considering this approach. 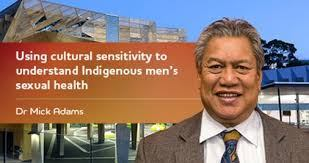 documented lack of Indigenous males in the health workforce at all levels. This National Strategic Framework is not a replacement of the 1989 NAHS. It is a complementary document, which addresses contemporary approaches to primary health care and population health within the current policy environment and planning structures. It aims to guide government action over the next ten years through a coordinated, collaborative and multi-sectorial approach supported by Aboriginal and Torres Strait Islander health stakeholder organisations. This National Strategic Framework was developed following consultation on the National Aboriginal and Torres Strait Islander Health Strategy: Draft for Discussion, February 2001, produced by the National Aboriginal and Torres Strait Islander Health Council (NATSIHC). The Draft for Discussion was based on the 1989 NAHS and the report of its 1994 evaluation. It took into account the recommendations of the 1991 Royal Commission into Aboriginal Deaths in Custody, the Bringing Them Home Report, submissions made to the House of Representatives Inquiry into Indigenous Health and its final report entitled Health is Life. It also considered existing state and territory, regional and local Aboriginal and Torres Strait Islander health policies, strategies and plans. All these have been fundamental to shaping this National Strategic Framework. NATSIHC comprises members from the Commonwealth Government, the Australian Health Ministers’ Advisory Council representing State and Territory governments, NACCHO, ATSIC, the TSRA, the Australian Indigenous Doctors Association, the Congress of Aboriginal and Torres Strait Islander Nurses and individuals with specific expertise appointed by the Commonwealth Minister responsible for health. The chairperson of the National Health and Medical Research Council (NHMRC) also sits on NATSIHC as an ex officio member. “ We the Aboriginal males from Central Australia and our visitor brothers from around Australia gathered at Inteyerrkwe in July 2008 to develop strategies to ensure our future roles as grandfathers, fathers, uncles, nephews, brothers, grandsons, and sons in caring for our children in a safe family environment that will lead to a happier, longer life that reflects opportunities experienced by the wider community. We acknowledge and say sorry for the hurt, pain and suffering caused by Aboriginal males to our wives, to our children, to our mothers, to our grandmothers, to our granddaughters, to our aunties, to our nieces and to our sisters. 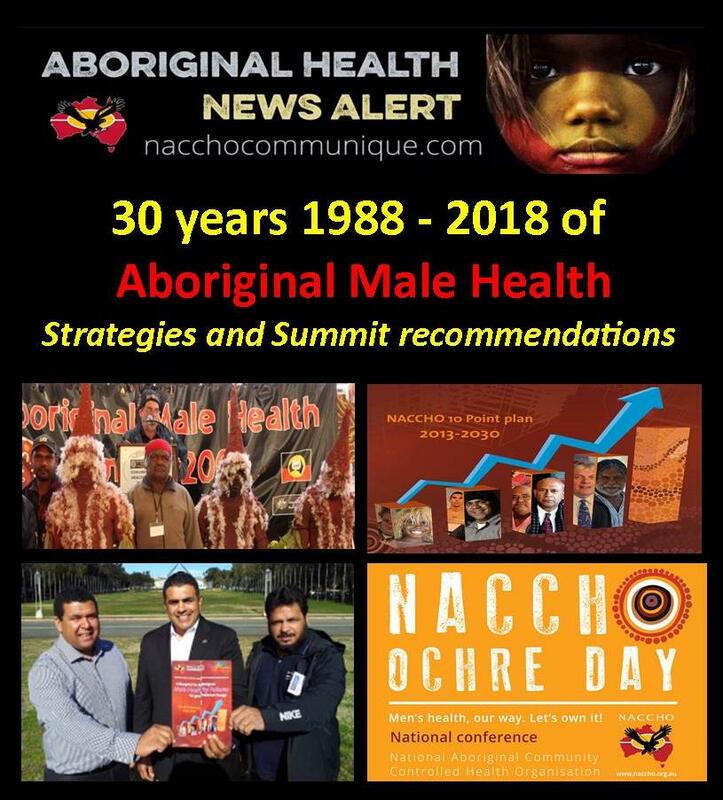 There has been over a decade of work by Aboriginal men to establish male health in the policy debates, but as I will outline later I feel we now need to move beyond the policy struggle to implementing the vision. Patrick Dodson has been quoted that: “There has been a process of undermining the role and status of Aboriginal men within our society since the early days of Australia’s colonisation and continuing in recent commentary around the Northern Territory Intervention”. When you add to this the rapid changes in the role of males within that colonising society and the consequent dislocation of non-Aboriginal males and their struggle to define new self-images, it is no wonder that Aboriginal males may struggle to make sense of the contemporary world. And if those critical views of us as Aboriginal males are expressed with no effort to understand our cultural values, or the pressures caused by the colonial relationships and contemporary social transformations, then we become alienated from this society. This alienation is at the core of the struggle for male health and wellbeing, as it acts to debase men, stripping away their dignity and the meaning in their lives. We therefore need to confront these social relationships that shape our health. Establishment of community-based violence prevention programs, including programs specific to Aboriginal men. Establishment of places of healing for Aboriginal men, including men’s shelters/’sheds’, short term ‘drying out’ places for men, and more resources for long-term rehabilitation of Aboriginal men with alcohol and other drug problems, preferably within their own community. Also ‘half-way’ houses to either give ‘time out’ or time to move slowly back into work/family/training, preferably to be run by Aboriginal men. Tax-free status for three years for identified communities for Aboriginal and non-Aboriginal professionals to attract much-needed doctors, health workers, teachers and police. Also incentives to employ Aboriginal people in similar positions. Building the capacity of Aboriginal men in literacy and numeracy to access locally-based jobs, and better support for establishing local Aboriginal-controlled businesses to tap into the minerals boom, agriculture, aquaculture or whatever business activity is relevant to their traditional country. Also the linking of education and training to locally-based employment. ‘Unfinished business’ – This Summit calls on the Federal Government and the Northern Territory Government to respond to its final report within three months (by the end of September, 2008). 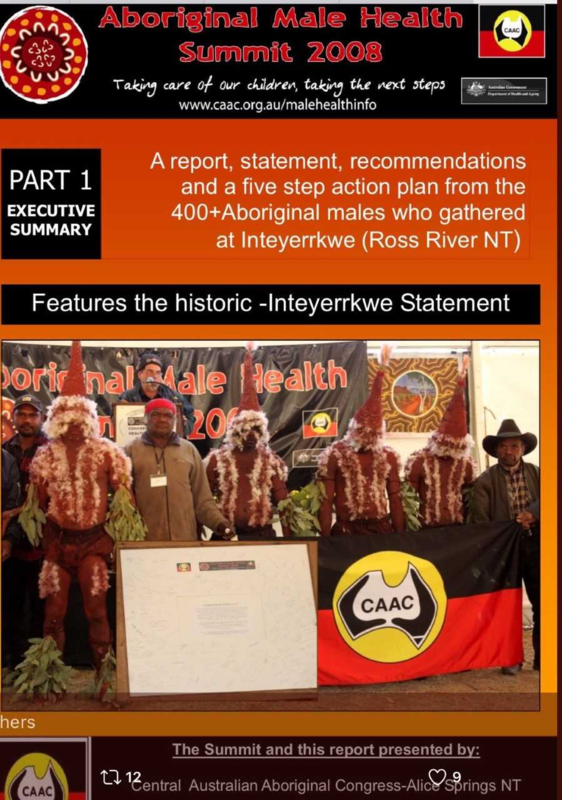 On 30 May 2014 Senator the Hon Fiona Nash, Assistant Minister for Health, announced that an Implementation plan would be developed outlining the Commonwealth’s coordinated efforts to improve Aboriginal and Torres Strait Islander health outcomes. 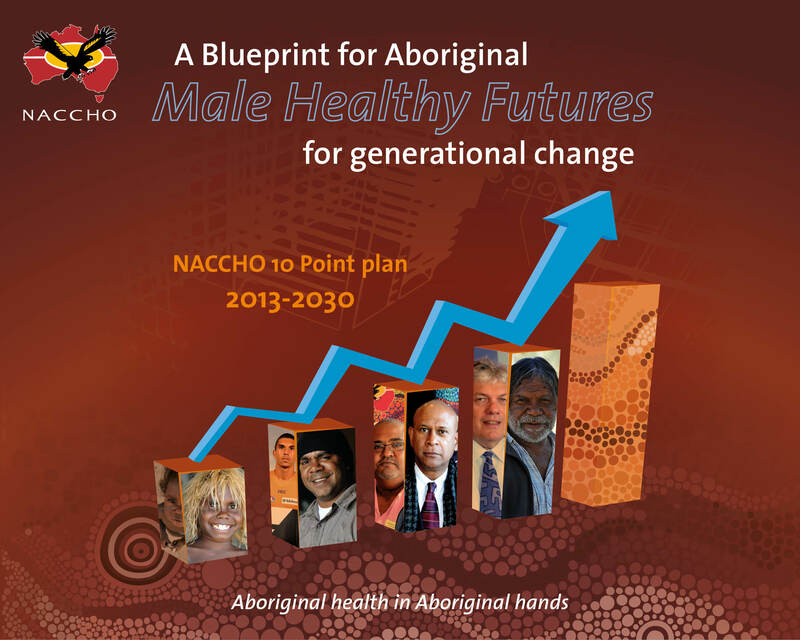 NACCHO has long recognised the importance of an Aboriginal male health policy and program to close the gap by 2030 on the alarming Aboriginal male mortality rates across Australia. 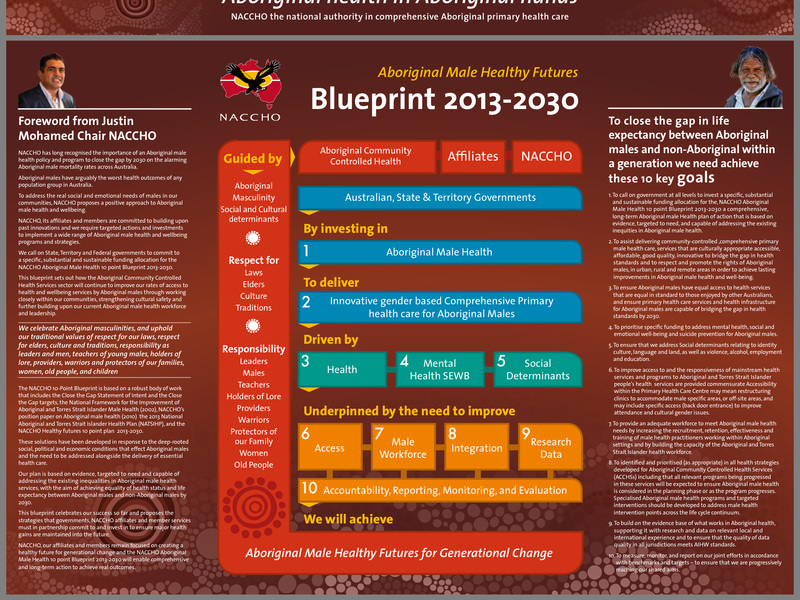 This blueprint sets out how the Aboriginal Community Controlled Health Services sector will continue to improve our rates of access to health and wellbeing services by Aboriginal males through working closely within our communities, strengthening cultural safety and further building upon our current Aboriginal male health workforce and leadership. NOTE : Throughout this document the word Male is used instead of Men. 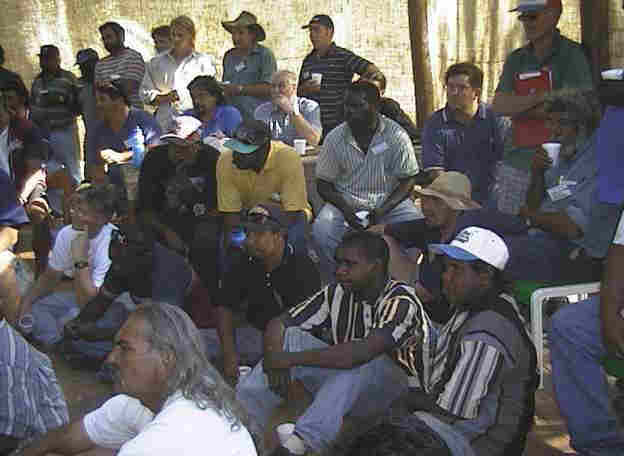 At the inaugural Aboriginal and Torres Strait Islander Male Health Gathering-Alice Springs 1999, all delegates present agreed that the word Male would be used instead of the word Men. With the intention being to encompass the Male existence from it’s beginnings in the womb until death. Throughout this document the word Aboriginal is used instead of Aboriginal and Torres Strait Islander. 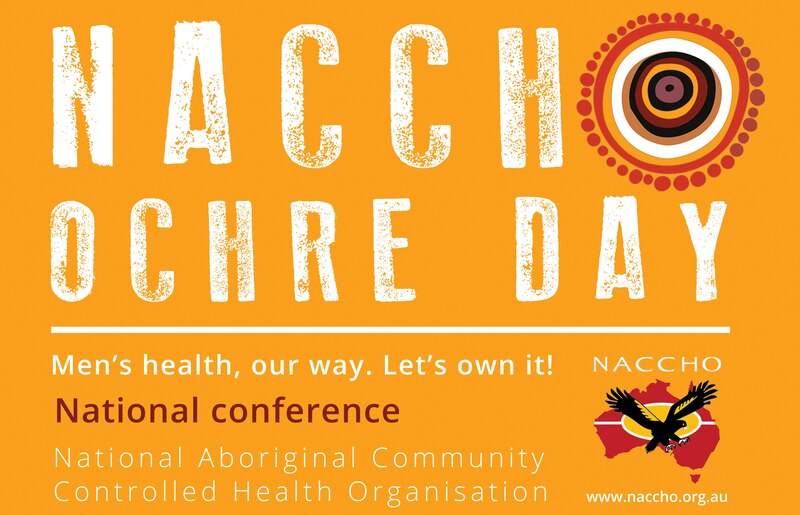 This is in line with the National Aboriginal Community Controlled Health Organisation (NACCHO) being representative of Aboriginal People. This does not intend to exclude nor be disrespectful to our Brothers from the Torres Strait Islands. “The week-long #MensHealthWeek focus offers a “timely reminder” to all men to consider their health and wellbeing and the impact that their ill health or even the early loss of their lives could have on the people who love them. The statistics speak for themselves – we need to look after ourselves better .